Not to be confused with Subsidiary or subsidy. This article is about the general principle of subsidiarity, with particular reference to European Union law. For the Catholic social teaching, see Subsidiarity (Catholicism). Subsidiarity is perhaps presently best known as a general principle of European Union law. The Oxford English Dictionary defines subsidiarity as "the principle that a central authority should have a subsidiary function, performing only those tasks which cannot be performed at a more local level". The concept is applicable in the fields of government, political science, neuropsychology, cybernetics, management and in military command (mission command). Subsidiarity is a general principle of European Union law. In the United States of America, the principle of States' Rights is enshrined in the constitution. Although the principle is older, its expression in the term "subsidiarity" was first coined in 1891 by the Roman Catholic Church for its social teaching. The OED adds that the term "subsidiarity" in English follows the early German usage of "Subsidiarität". More distantly, it is derived from the Latin verb subsidio (to aid or help), and the related noun subsidium (aid or assistance). The concept as discussed here was first described formally in Catholic social teaching. Coupled with another Christian democratic principle, sphere sovereignty, subsidiarity is said to have led to the creation of corporatist welfare states throughout the world. Alexis de Tocqueville's classic study, Democracy in America, may be viewed as an examination of the operation of the principle of subsidiarity in early 19th century America. De Tocqueville noted that the French Revolution began with "a push towards decentralization ... in the end, an extension of centralization". He wrote that "Decentralization has, not only an administrative value, but also a civic dimension, since it increases the opportunities for citizens to take interest in public affairs; it makes them get accustomed to using freedom. And from the accumulation of these local, active, persnickety freedoms, is born the most efficient counterweight against the claims of the central government, even if it were supported by an impersonal, collective will." As Christian Democratic political parties were formed, they adopted the Catholic social teaching of subsidiarity, as well as the neo-Calvinist theological teaching of sphere sovereignty, with both Protestants and Roman Catholics agreeing "that the principles of sphere sovereignty and subsidiarity boiled down to the same thing". Will the American people never learn that, as a principle, to expect swift response and efficiency from government is fatuous? Will we never heed the principle of subsidiarity (in which our fathers were bred), namely that no public agency should do what a private agency can do better, and that no higher-level public agency should attempt to do what a lower-level agency can do better – that to the degree the principle of subsidiarity is violated, first local government, the state government, and then federal government wax in inefficiency? Moreover, the more powers that are invested in government, and the more powers that are wielded by government, the less well does government discharge its primary responsibilities, which are (1) defence of the commonwealth, (2) protection of the rights of citizens, and (3) support of just order. Decentralization, or decentralising governance, refers to the restructuring or reorganisation of authority so that there is a system of co-responsibility between institutions of governance at the central, regional and local levels according to the principle of subsidiarity, thus increasing the overall quality and effectiveness of the system of governance, while increasing the authority and capacities of sub-national levels. Systemic failures of the type seen in the crash of 2007/08 can largely be avoided, since diverse solutions to common problems avoid common mode failure. Individual and group initiative is given maximum scope to solve problems. The systemic problem of moral hazard is largely avoided. In particular, the vexing problem of atrophied local initiative/responsibility is avoided. When a genuine principle of liberty is recognised by a higher political entity but not all subsidiary entities, implementation of that principle can be delayed at the more local level. When a genuinely efficacious economic principle is recognised by a higher political entity, but not all subsidiary entities, implementation of that principle can be delayed at the more local level. In areas where the local use of common resources has a broad regional, or even global, impact (such as in the generation of pollutants), higher levels of authority may have a natural mandate to supersede local authority. Subsidiarity is perhaps presently best known as a general principle of European Union law. According to this principle, the EU may only act (i.e. make laws) where action of individual countries is insufficient. 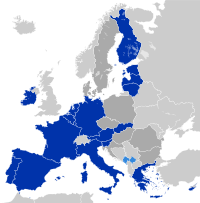 The principle was established in the 1992 Treaty of Maastricht. However, at the local level it was already a key element of the European Charter of Local Self-Government, an instrument of the Council of Europe promulgated in 1985 (see Article 4, Paragraph 3 of the Charter) (which states that the exercise of public responsibilities should be decentralised). Subsidiarity is related in essence to, but should not be confused with, the concept of a margin of appreciation. A more descriptive analysis of the principle can be found in Protocol 2 to the European Treaties. The Court of Justice of the European Union in Luxembourg is the authority that has to decide whether a regulation falls within the exclusive competence[a] of the Union, as defined by the Treaty of European Union and its predecessors. As the concept of subsidiarity has a political as well as a legal dimension, the Court of Justice has a reserved attitude toward judging whether EU legislation is consistent with the concept. The Court will examine only marginally whether the principle is fulfilled. A detailed explanation of the legislation is not required; it is enough that the EU institutions explain why national legislation seems inadequate and that Union law has an added value. Furthermore, in the fifth recital the Parliament and the Council stated that the action taken by the Member States in response to the Commission's Recommendation has not fully achieved the desired result. The Community legislature therefore found that the objective of its action could not be achieved sufficiently by the Member States. Consequently, it is apparent that, on any view, the Parliament and the Council did explain why they considered that their action was in conformity with the principle of subsidiarity and, accordingly, that they complied with the obligation to give reasons as required under Article 190 of the Treaty. An express reference to that principle cannot be required. ^ Oxford English Dictionary. https://en.oxforddictionaries.com/definition/subsidiarity Definition: "[mass noun] (in politics) the principle that a central authority should have a subsidiary function, performing only those tasks which cannot be performed at a more local level:"
^ Early German usage: Subsidiarität(1809 or earlier in legal use; 1931 in the context of Catholic social doctrine, in §80 of Rundschreiben über die gesellschaftliche Ordnung ("Encyclical concerning the societal order"), the German version of Pope Pius XI's encyclical Quadragesimo anno (1931))". ^ "Das Subsidiaritätsprinzip als wirtschaftliches Ordnungsprinzip", Wirtschaftliche Entwicklung und soziale Ordnung. Degenfeld-Festschrift, Vienna: von Lagler and J. Messner, 1952, pp. 81–92 , cited in Helmut Zenz, DE . ^ Bak, Hans; Holthoon, F. L. van; Krabbendam, Hans; Edward L. Ayers (1 January 1996). Social and Secure? : Politics and Culture of the Welfare State: a Comparative Inquiry. VU University Press. ISBN 9789053834589. The Christian democrats promoted a corporatist welfare state, based on the principles of the so-called "sphere sovereignty" and "subsidiarity" in social policy. ^ Schmidt, Vivien A, Democratizing France: The Political and Administrative History of Decentralization, p. 10 . ^ Segell, Glen (2000). Is There a Third Way?. Glen Segell Publishers. p. 80. ISBN 9781901414189. When the Dutch Protestant and Catholic parties combined, to form the Christian Democrats, the two parties agreed that the principles of sphere sovereignty and subsidiarity boiled down to the same thing. ^ Reid Buckley, An American Family – The Buckleys, Simon & Schuster, 2008, p. 177. ^ Decentralization: A Sampling of Definitions, Joint UNDP (United Nations Development Programme)-Government of Germany evaluation of the UNDP role in decentralization and local governance, at the United Nations Development Programme website, October 1999, pp. 2, 16, 26. ^ a b Macrory, Richard, 2008, Regulation, Enforcement and Governance in Environmental Law, Cameron May, London, p. 657. ^ Shelton, Dinah (2003). "The Boundaries of Human Rights Jurisdiction in Europe". Duke Journal of Comparative and International Law. Duke University School of Law. 13 (1): 95–154. Retrieved 17 April 2017. ^ Protocol 2 to the European Treaties. ^ Exclusive competencies are those matters that the member states have agreed with each other by treaty are those that they should achieve jointly (typically through the European Commission). All other matters remain as "national competences" (each member decides its own policy independently). International trade agreements are an example of the former, taxation is an example of the latter. Look up subsidiarity in Wiktionary, the free dictionary. This page was last edited on 7 September 2018, at 21:45 (UTC).